Today I had planned on writing about and sharing about our family's 3 day trip, after we got home late last night. My sons were fighting, and in the process a heavy metal door slammed open, crushing my 9 year old son, Ike's, finger between the door and a cement wall. It was bleeding and looked so horrible and I knew it needed immediate medical attention. Immediately I rushed out with him to attempt to go to the local doctor, only to discover that the clinic was closed. So we walked to the bus stop to take a bus into the city. I called my dad to ask him advice what to do and he said to go to urgent care. I knew though that I needed a referral in order to get insurance to pay for urgent care. I called the emergency doctor in my town and he asked me to send him pictures of the injury, and then since it wasn't clear enough, he turned around his car (he was driving and had nearly gotten to our town) and had us get off at the first bus stop in the city, where he met us and inspected the wound, then recommended that we go to the urgent care center, to which he then drove us. At the urgent care center, they checked my son, x rayed it, and confirmed that it was broken. But since he also had a pretty deep cut on his finger, they weren't sure what to do with it, so they sent us to the ER. Fortunately they also gave Ike some pain relief medication since he was in a lot of pain. We got to the ER and had to do a ton of waiting. 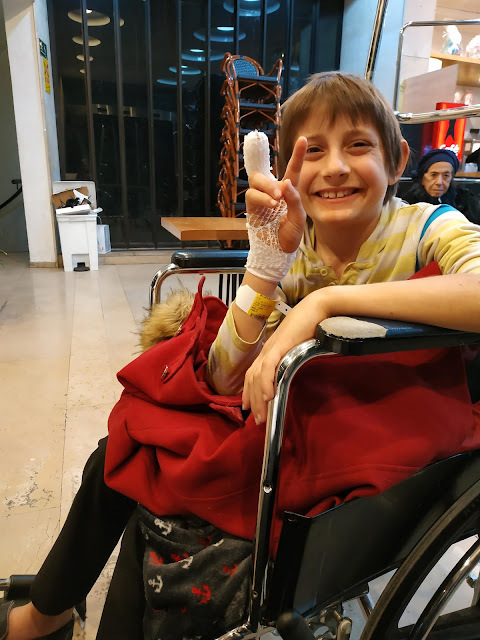 When we finally got to see the orthopedist after a long wait, they told us that they'll be sedating Ike, and stitching him up under sedation, and to go to the children's ER to prepare for sedation. Only there was a really, really, really long wait at the children's ER before they finally prepped him. Ike got very scared, especially because the heparin lock really hurt him, and I was there for him emotionally and reassuring him and empathizing with him, and eventually he calmed down somewhat, but he was still quite scared about the sedation, afraid that he'd feel what was going on in his hand but be unable to tell them that it hurt him. When we finally got to the room where they were going to be sedating him, they explained a little more what it was going to be like. How he would be awake but not feel anything. That he wouldn't remember anything after. And then he went in and I was outside, and it was so hard to be patient, not knowing exactly what they were doing and why it was taking so long. When they were finished and Ike started waking up, he was really hilarious. He was totally on drugs and when I commented that out loud, one of the medical staff in the room said "Yea, he's doped up". I took numerous videos of Ike and the hilarious conversations we had, so I could show him afterwards. The doctor told me that despite his finger being broken, they weren't casting it or anything, since the break was at the very tip of his finger. This is twice already that Ike broke a bone, and twice already that he doesn't get any cast. This is one lucky kid. Eventually, the drugs wore off, and since he was able to keep food and drink down afterwards, we were able to come home. I am so grateful for my community of friends. To my neighbor who took in my kids when I went to the ER, fed them supper, and put them to bed for the night, to the doctor who drove into the city to advise me on what to do for Ike, to the friend who brought me and my son a restaurant meal to the hospital since we were there for hours without eating anything, to my friends who chipped in for a taxi to bring us home. I'm really hoping that Ike has an easy recovery. They want me to follow up with a hand specialist next week at the hospital, so that's another thing to add to my busy life. Fortunately Ike has a pretty high pain tolerance level. And since kids heal quickly, hopefully he'll be back to himself in no time. Unfortunately, this is his right hand and he's a righty. Anyone else ever have similar things happen to their kids? How long was the recovery time? Not exactly similar, but I have 4 active boys and I felt like, for a while when they were smaller, that we had the "Frequent Flyer" card at the emergency room. We are lucky to live in a major city with a terrific Children's Hospital. And then a great Urgent Care also opened up about 5 minutes from our house. We've had MANY sets of stitches and a broken wrist. And most recently (last week!) a broken nose from wrestling (my high school son is on the wrestling team). It's always something!! And like you, I hate seeing my kids in pain. Glad he's healing and that it wasn't too bad! One rainy afternoon/evening my sons were fighting over scissors. Yes, one got a bad cut, and I ran with him to the local doctor across the street, who said he need ER. My husband was due in on the bus, which would do a quick return to Jerusalem. So I met him as he was getting off, took his bag and sent the two of them to ER. In the meantime, as it was raining, electricity went off, and the younger one was hysterical alone in a dark house, when my daughters arrived. Of course they thought me an abusive mother for leaving him alone in the dark. But it wasn't dark when I left. I had three active boys and one girl. Over the years the boys were frequent visitors to the ER but my daughter only went once when someone accidentally closed a heavy window on her index finger. Sending best wishes to Ike for a speedy recovery! Brave young man and brave Mama! I am horribly squeamish and it must have been traumatic for you. Our daughter got a spiral fracture when standing on a sled and going down a bank in our back garden during heavy snow. Took months of recovery time and lots of follow-up trips to the hospital.She was at secondary school and there were no lifts so she had to miss out some lessons and play catch up. Thankfully she is academic and managed to keep on top of it.